Welcome to the Fido-History-Project 3rd Generation ! [30.09.2009] Can be the FidoBase Project be part of the Fido-History-Project ? Well, because the FidoBase contains messages from at least 1996 its also be a part of the Fido-History-Project. The only problem is, its not yet well documented. Starting today, i'll try some documentation on this. Actual Source is a bundle of PERL scripts. 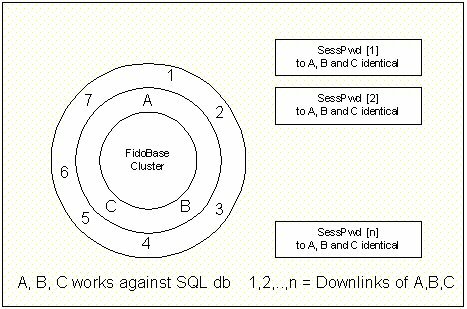 Example: if downlink #2 at ftn node B writes a mail, the mail flows thru ftn node B to ftn node A, pushed with a perl script into the MySQL database of cluster node A and then will be forwared to cluster node B with sql inserts (also to cluster node C). 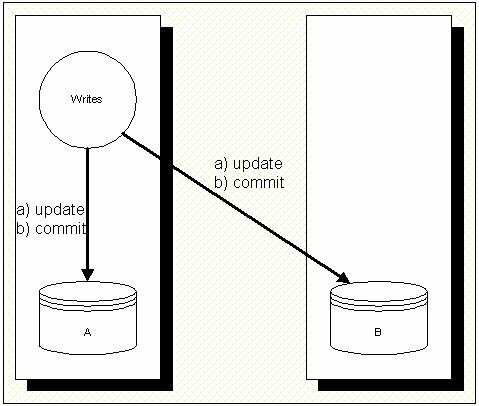 The actual system uses the Dual Write method. Each downlink can connect to all cluster nodes. The connection will be a ftn mailer session. The session password is read from the online database that resides on each nodes cluster site. Mailbundles will be streamed online, on the fly to the connected downlink from the nodes cluster database (echo_temp). 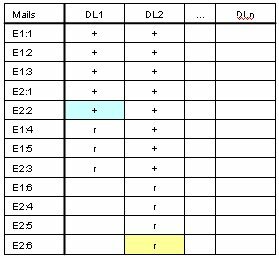 If the downlink connects a 2nd time onto anothers cluster node, the tables needs updated just in time, so the downlink doesn't receive the mailbundle again. This method is actual used by the FidoBase project (see above). 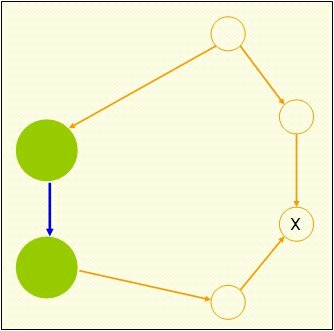 Based on the Dual Writes method, each Commit is queued for all connected nodes. If a node is offline, the queue increases until the node is back online. Each node has to use a detect and resolve conflicts resolution algorhytm (dupe detection). If a dupe is identified, the related records needs to be bounced. 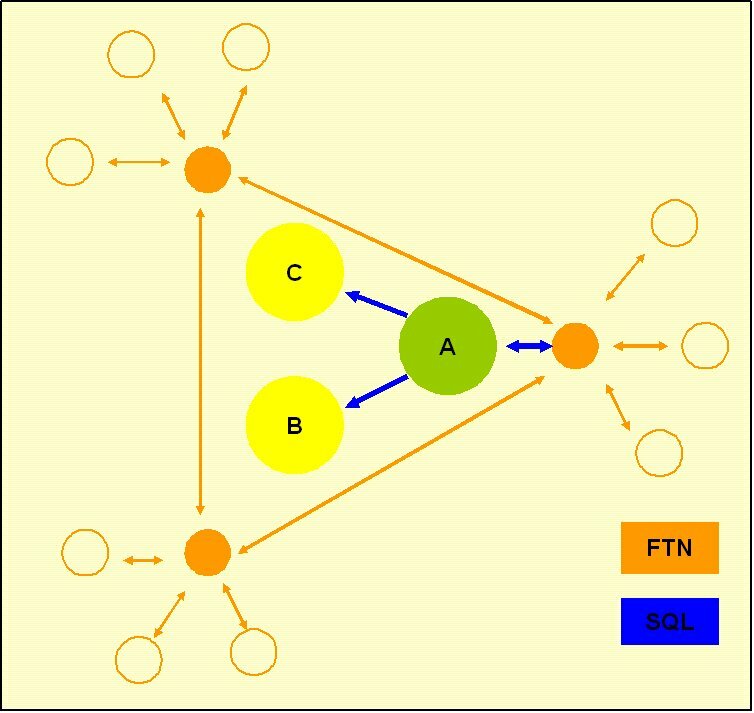 Each node has two inputs: the ftn mailer input and the syncing queue. Both queues needs to be merged at each nodes cluster end. Queue-IN: needs information of source (FTN Mailer or Cluster Node Update). Processing needs information about source of update, so updates from FTN mailers needs to be written to database and Queue-OUT. Udpates from Cluster nodes needs to be written only to database. 2.2 Push or Pull Updates or Both ? Push and/or Pull or Both updates needs info about available cluster nodes. ... so the list of cluster nodes can increase / decrease and is flexible. If a cluster node goes offline forever, all related records in the Queue-OUT can be deleted. Records needs to be created in the Queue-OUT for all cluster nodes except the own cluster-node. This process writes updates to the Queue-IN with the information of source (FTN mailer or Cluster node update). The Update Process is the main sync process on each cluster node. This process needs to be triggered by the FTN mailer process and on recuring schedules. If a cluster node goes offline forever, the queues still needs cleaned from records for this offline cluster node. Full or partial rescans are no problem with this design. Trigger a full rescan exports all records from the database to the Queue-OUT for a specific cluster node. Partial rescans can be handled by count or days (export the last 5000 records, export the last 3 months). As of the dupe detection on the other side, dupe records are prevented. This procedure describes only the sync of cluster nodes with updates from FTN mailers. But it doesn't includes the update to the downlinks. How get the downlinks their bundles? i. Handle downlinks as they were cluster nodes too ? ii. 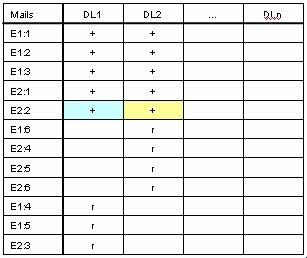 Handle downlinks with tables of highwatermarks for each connected area ? 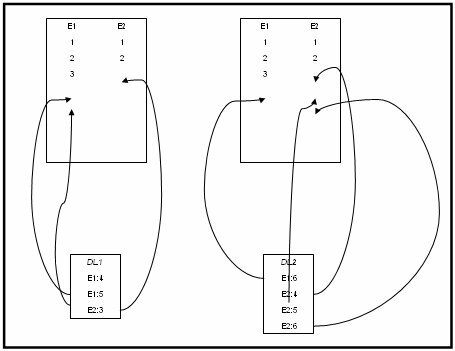 i. has the problem, that each cluster node has to queue all the mails for all downlinks, so the mails in the Queue-OUT needs to be duplicated to all real cluster nodes, because each downlink can connect to one of the other real cluster nodes. If the downlink connects to one real cluster node, the pulled mails from Queue-OUT also needs deleted from the Queue-OUT of the other real cluster nodes too. ii. the order of mails in each cluster nodes database can vary as the input may be unordered. This complicates the use of highwater marks. 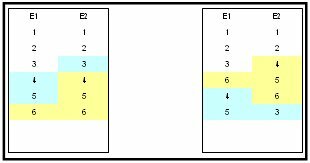 The highwater mark in database of cluster node A isn't the same highwater mark in the 2nd database of cluster node B and vice versa. 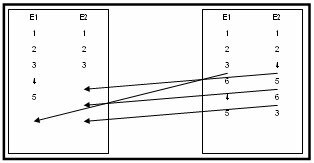 If a downlink connects to a cluster node, the cluster node has to identify the point of which mails the downlink has received the last mail in one area (this is the same problem for all connected areas). What's next time Downlink 2 connects to Cluster Node A and tries to get his 'actual' mails ? Remember: Downlink 2 sends mails Echo 1: #6, Echo 2: #4, #5, #6. The last sent mails for Echo #1 is #3, and for Echo 2 is #2. So sending all mails after Echo 1 #3 and Echo 2 #2 doesn't fit. Downlink 2 only needs the blue ones. To add and remove Cluster Nodes, a table that holds the Cluster Nodes info needs to exist. Update Record thru Replication process. To add and remove Downlinks, a table for Downlinks (with Session Password) needs to exist. 2.7.3 Update Table Structures ? 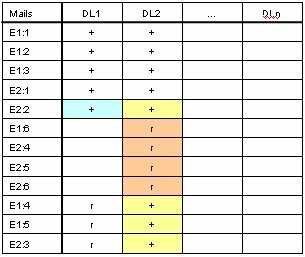 Update table structures thru Replication process ? Which MsgID will win ? If the failed cluster node comes back online, the authoritive restore overwrites dupe collisions upto the moment the cluster node is in sync again. One link rcvd mail from downlink 1, downlink sends also mail thru FTN channel to downlink 2 (but needs some time). Cluster node forwards and exports mail to downlink 2. Now dupe detection is at FTN channel side, unreachable for the cluster node dupe detection process. Prevent sending mails to downlinks with known addtl. FTN links ? 2. is one of the msgs from (last) dupe-master? 4. if no, is (last) master online? FTN mailer downlinks doesn't have their own intelligence but needs to be included into the sync schema. One possible solution can be to build up the replication schema for FTN mailer downlinks within the database virtualy. This needs inclusion for all connected and sub-connected FTN mailer systems that are connected to any of the echo areas. 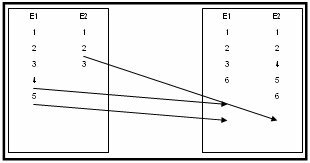 If mails are exported to FTN mailer downlink #1 who has 2 FTN mailer downlinks the export has to be recorded into the system too. Cluster node A exports to FTN mailer downlink #1. Tables needs updated for downlink #1. Downlink #1 has also 2 more downlinks, downlink #2 and #3. 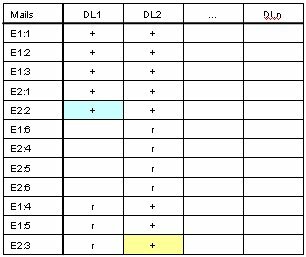 Tables for downlinks #2 and #3 has to be added into the system and needs to be updated in the same way as downlink #1 table is updated. By default actions, larger dupe ring detection is impossible as the database actions are as fast as possible. Mail flow thru the FTN mailers are someway delayed. If sometimes the cluster node insert into database process of a single mail will be delayed, the mailflow thru the FTN mailer ring starts and ends up on the same cluster node or another cluster node, the information of the dupe ring can be detected. Using this mechanism, is an option in detecting dupe rings and further prevention of dupes by setting the related FTN mailer downlink to import or export state only. But the problem on this idea is, the mails that are used as test ping needs to be production mails to be tossed into the mail databases of all FTN downlinks to get them passed thru. ;& so that sending test ping mails have to use production mails ... i.e. monthly rules posting ?!? Sending test pings in the cluster node synchronisation is no problem, but sending test pings thru FTN downlinks tossers, that aren't aware of special 'test ping' mails is a problem. If a rules posting is received at one cluster node, the rules posting will be added the delayed action - meaning, waiting 24 hours to send out to the next downlink, awaiting next receive, send to the next downlink, wait again 24 hours and so on upto the last downlink (adding different X-TEST kludges to different downlinks? to identify late distributions thru other channels?!?). PATHS: Maintain and report PATHS a message takes within an echo. Copyright (C) 1991-1992, Graham J Stair. All rights reserved. |    |    +->2:2432/390  (1 of 1)               ? ? |    |    |                                -------> 2:240/5832 ? |    |    |                                -------> 2:2437/33  ? |    +->2:2432/390  (1 of 1)               ? ? |    |                                -------> 2:240/5832 ? |    |                                -------> 2:2437/33  ? As in the history plain old DOS software is used and timestamps are packed with the DOS timepack algorhytm, timestamps with the 2 second difference could be a problem in syncing two databases. So the proposal is, to convert all timestamps to timestamps with even seconds. Every timestamp conversion then needs to be filtered thru the 2 seconds correction routine. Timestamp A: 2009-10-03 10:28:02 -> OK.
During my exercises last year, while merging and cleaning the databases from Dirk and Knut, i found that for the old dataset, the inclusion of ftscdate in the dupcheck key resulted in more dupes in the database. If I recall correctly, the differences were larger as the modulo 2 seconds. For the size of the merge, using only folder, msgid and subject pooved to be sufficient. Athough it will probably not happen anymore, I found that the msgid of messages where this attribute is missing, can reliably be generated before inclusion into the DB. If for purist reasons this atrribute should not be added to the original message, the special attribute will do. [Apr 2010] Starting with some php coding for *.msg imports into the Fidobase2 I'm running into problems with the dupes checking method as implemented. Archives a01 to a12 are mails from years 2006 upto 2009. Archive a13 includes mails from the time, Dirks link gots broken so the Fidobase2 database doesn't includes rest of the mails from the archive a13, a14 and BBCON96 (that is the production archive). a13a, a13b and a13c are archives from a different source converted from CrossPoints Puffer format to FTS1 *.MSG format and imported into the MySQL database Fidobase2. Why so many mails not in the database yet ? Does the dupecheck not function ? Are there missing mails in the database ? Missing mails in archives a13, a14 and BBCON96 are expected. But what is with the missing mails from archives a01 to a12 (GT 6300 mails)? A typical Puffer transfer Date looks like: "EDA: 20091209184600S+2"
and "S+2" is the TZ info difference to the local time. Here: Summertime + 2 hours for local time will result in local time: 20:46:00. Otherwise there is a difference of 2 hours to yet existing mails in the database. Alternate is W+0, that means add +0 hours, means use the time as is. Some of the subject lines includes "Re:"'s. So therefor the dupecheck doesn't found the records that were saved before w/o the "Re:"'s. The next try of import results in better identifying dupes, but there are much more problems. CRC32 of text part, w/o Kludges until the Origin line. x2) The MsgID dupes prob relates to a bug in the CrossPoint to FTS1 *.MSG converter, that stripped half of the informations of MsgIDs. Needs to be reviewed in next import try. I've added a dupe weight system in analyzing dupe problems. MsgUd hasn't been created from orgin AKA. It uses the Kludges content which includes a MsgId: "1:2320/105.999 40f6575e"
[ctrl+A]RFC-X-Commentary: Spam is lame. Spammers are bad. that was originaly an import of a nntp post ??? All paths goes thru "2432/200 240/5778 5138"
But what its a mistery with this mail, the different delivery paths before that. How can one mail be delivered thru different channels resulting in one mail ?!? the original subject and date can be set as the first entry point. needs to be modified that way, that aka from originnode becomes the higher priority. This will reflect the analyze results from this mail example. # 18:40:19         subject : Anwaelte I.
so probably a problem with the stripkludge() function exists ?!? it becomes courious ... how a mail could be modified with a software with a TID where the software was compiled half a year later ?!? Was this mail a result of a software upgrade ? and has this mail been resent after the software upgrade ?!? From a review, the 2nd mail is a dupe, that needs to be eliminated. The problem: how can this be done ? The body part has been stored with parts of the kludge lines. Those kludge lines needs to be stripped before analyzing the body content. So this has been done in the program. But this procedure probably doesn't work as expected. the Area and the kludges lines needs to be stripped. The stripkludge() routine searches for chr(1) positions and continues searching for further chr(1) positions until no more chr(1) is found. The last step is to search the next occurance of chr(13) and storing the string that follows this position. On a test program, the exported body text i've saved to a text file and run the stripkludges() routine over the exported text files. The result of this test is: the stripkludges() procedure works. The tearline difference needs further rethinking. The result is, to modify the stripkludges() routine to strip the kludges within the body and also strip all following the tearline. # 04:54:50         subject : Anwaelte I. The difference(s) are hard carriage returns in the first entry. Line endings in mail with ftscdate 05 Jun 06 22:00:42 are 0Dh only. 25 line endings with addtl. 0Ah results in above length difference. So body content needs also "normalized" by replacing line terminations 0Dh + 0Ah to 0Dh only. This is probably from crosspostings that results in the same MsgID under different echoes. So therefor the folder check is an essential requirement. Also prevent modifications of subject line before trying to save it into the database. Probably on dupechecking, the transformed (escaped chars, Umlauts) subject lines results in not found. Subject expected was escaped before dupechecking. Maybe its better to use the raw subject line on dupechecking and thereafter make all the transformations for saving into the database. x3) MsgID is not an default index yet. Needs to be added to the database structure. x4) ftscdate +/- 1 Std. or +/- 2 Std. With 2 Gb used memory by selecting all records from table echo_f needs some further modifications to the script. limit results to 1000 records ? 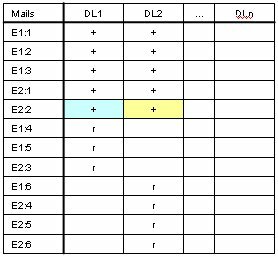 continue selecting id GT last analyzed record? that means, the script runs the 3rd main loop iteration w/o memory overflows. In manualy inspecting those debugging infos, first I have to query fidobase1 for id='7167', getting the msgid, and searching this msgid in fidobase2. The re-check is to search for the given msgid in fidobase1, that results also with one record. MySQL admin lists 196.042 records in table echo_f, so probably this record was stored in a previous run. So here, I stopped analyzing the dupechecking algorythm, and reset the fidobase2 for a full import run. Same folder, Same length, different ftscdate, different body CRC. 13 chars different in body text. On visual review I say, this is No dupe. Seenby field have to start with: "SEEN-BY: ..."
id "4438", ftscdate "08 Dec 06 07:22:30"
id "28616", ftscdate "08 Mar 08 11:12:39"
eliminate dupes based on identical body crc ? keep dupes caused by different ftscdate ? Smapi is a modified message API for accesing *.MSG, Squish and Jam message base files. 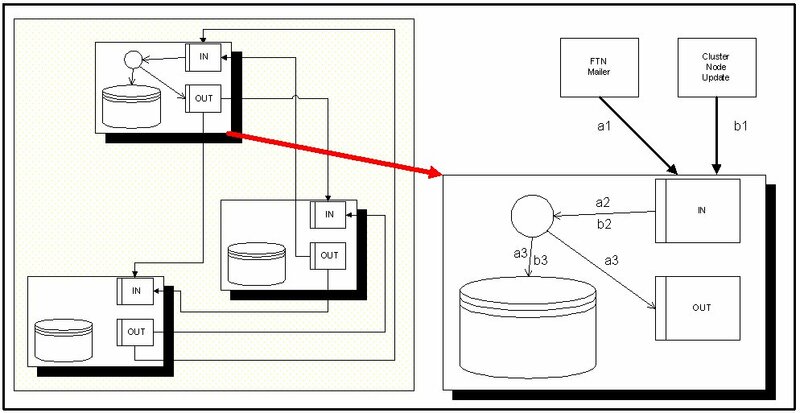 A multi-site synchronisation schema can be established. So therefor one idea to circumvent dupes is to "normalize" all mails before using mails in the compare process or before importing (normalized dupechecking). The requirements for dupechecking may vary in the future, so the question that arise is how to store the dupechecking information? The MIT-LCS-TR-205 publication introduces some enhancements to control and assist the sync and replication process. Between Oct and Dec 2009 the link 2443/1313 - 2432/200 gots broken. April 2010 a request received me about missing links. Links have been updated. As of a long time development w/o any documentation, i'll give this a try. If there is new infos from the past, they will be added.